In Minnesota, native blueberries thrive on acidic soils (pH 4.0 to 5.0) that are low in fertility. Blueberries are frequently found on burned-over areas from recent wildfires, areas that have been logged or sites with ledge rock or rock outcrops. Blueberries can also be found growing along the edge of bogs. Wild blueberry plants are readily established from seed. As they grow, plants send out underground stems, or rhizomes, that grow on top of the ground. Roots develop along the rhizome and produce new stems/plants. By the end of the first year, buds are formed and over winter on the plant. The second year is dedicated to berry production. Full sun is an essential requirement for berry production. Plants will tolerate some shade, but overtopping vegetation limits blossoms and fruit production. An excellent example of integrating blueberry production into woodland management comes from experienced foresters. In northern Itasca County, a stand of mature jack pine was harvested in 1978. The landing area, about 1.5 acres in size was designated as a permanent wildlife opening. A year later during a field inspection, the forester noticed blueberry plants that had naturally seeded into the site—a definite benefit to wildlife. The decision was made to manage the wildlife opening for berry production. The site has been periodically mowed to the height of about 12 inches in 1980’s and 1995. Overtime, willow and hazel began to encroach into the site, overtopping the blueberry plants, and vegetation treatments have been timed to not interfere with harvesting. The managing forester is quick to note that this blueberry site is a gem and protected by silence by local families who return each year to harvest berries. Lucille Lauer graduated from the University of Minnesota with a degree in horticulture in the 1980s. While on campus, Lucille was able to have direct conversations with hort researchers Dr. David Wildung and Dr. Jim Luby while they were developing new cultivated varieties of blueberry plants. Lucille was excited about the idea and looked for an opportunity to put her knowledge and skills into practice. After college, Lucille’s family returned to Grand Rapids living on eighty acres of land. Working with her family, Lucille developed and planted four to blueberries, and has established a thriving ‘u-pick’ business called Blueberry Meadows. The business was started on a shoestring and has provided gainful employment for extended family and neighbors. 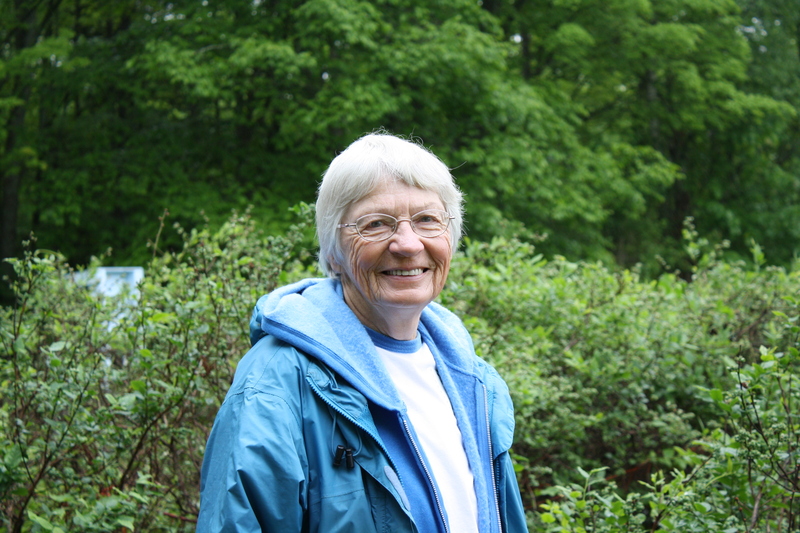 For Lucille, Blueberry Meadows is really about quality of life with no traffic or commute, healthy outdoor work and interactions with friends, family and neighbors who come and pick berries! The most recent patch was established in 2006, planting two acres with Chippewa and North Blue varieties. The meadow was fenced to keep deer from depredating the site that was cost-shared through DNR. 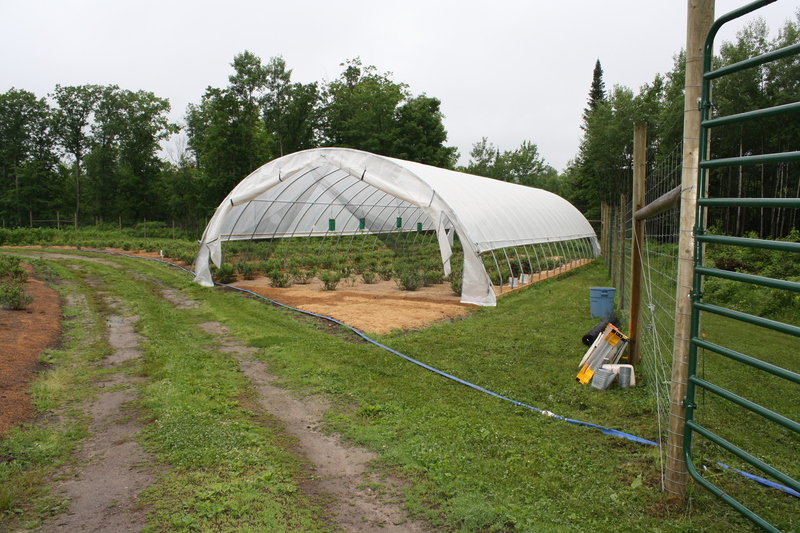 During the spring of 2010, Lucille obtained funding through the Natural Resource Conservation Service (NRCS) through the Environmental Quality Incentives Program (EQIP) and installed a 30x 72 foot high tunnel was installed over a few rows of blueberry plants. The high tunnel will benefit the plants during cold, wet springtime weather AND to give her business an edge by producing berries earlier. I received the following announcement from Dean Current, University of Minnesota Department of Forest Resources, today. It may be of interest to loggers, natural resource professionals, and some woodland owners considering woody biomass harvest options. -ed. Update: these demonstrations have passed. A nice KEYC TV news story with video of the harvester is here. We’re working on a video from the demos and will post that link shortly. Attached is a schedule of September 2009 Minnesota demonstrations of a bio-baler that has been developed for small diameter woody vegetation (Short rotation crops – willow, poplar, brushlands and young aspen thinnings. The bio-baler will be in Minnesota from Sept. 17th to Sept. 24th starting in Waseca at the Southern Research and Outreach Center harvesting short rotation willows and finishing up near Hibbing doing a thinning in young aspen. 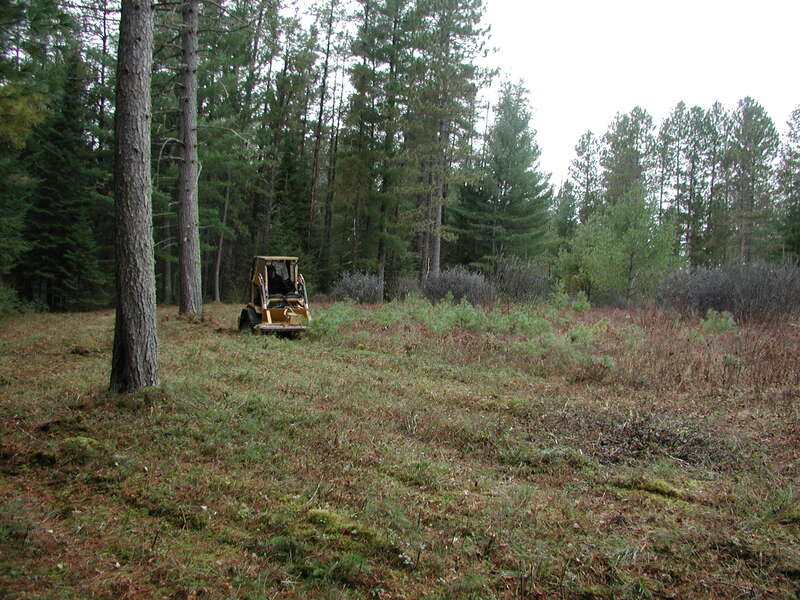 This could be an option for recovering biomass from some of the DNR’s wildlife habitat projects,short rotation woody crop plantings and other brushlands on a one-time or continuing basis. It might even be used for controlling hazel underbrush. As woody and herbaceous biomass becomes more and more viable for renewable energy, equipment companies have started engineering machines capable of harvesting the biomass quickly and efficiently. One such company is FLD Biomass Technologies of Canada who specialize in the design and manufacturing of machinery for agricultural and forestry production. A number of organizations are proud to be funding a demonstration tour of FLD Biomass Technologies’ FLD Biobaler WB55 in various locations around the state of Minnesota from September 17 to September 25, 2009. Click here for detailed schedule and contact info for the Minnesota demonstrations. The FLD Biobaler WB55 is an all-in-one tractor-pulled machine capable of cutting, compacting, and baling biomass up to four inches in diameter and 25 feet in height. This maneuverable machine has a rotating blade or hammer cutting system that has a low power requirement and produces naturally drying bales that can be transported using standard equipment. The Biobaler is suitable for many woody crops including: willow, poplar, aspen, alder, under story vegetation, invasive woody vegetation. Click here for detailed schedule and contact info for the Minnesota demonstrations. Sponsors of the FLD Biobaler WB55 Demonstration Tour include: Belwin Conservancy, The Blandin Foundation, CINRAM – University of Minnesota, Iron Range Resources, Minnesota Department of Natural Resources, Minnesota Power, The Minnesota Prairie Chicken Society, The Minnesota Sharptailed Grouse Society, The Nature Conservancy, Rural Advantage, Southern MN Initiative Foundation, University of Laval – Canada, University of Minnesota Extension, University of Minnesota Initiative for Renewable Energy and the Environment, University of Minnesota Southern Research and Outreach Center – Waseca, The Wildlife Management Institute, and Woodcock Minnesota. Small-scale logging is a system and a range of equipment that increases logging flexibility and extends production seasons. Small-scale logging is designed for harvesting operations where maneuverability is a primary concern. It is not logging small trees and/or small volumes. Whether you are a logger, forester, woodland owner, or other land manager, this field day will show you how to maximize profitability through the use of small-scale logging and harvesting equipment, using efficient and safe techniques. From tree to finished product is the main theme of this event, with a focus on the private landowner. For more details, including schedule and registration information, check out the event brochure (PDF) or contact Gary Bradford at (218) 927-4599 or Patrick Lanin at (218) 764-3315. This event is hosted by Northwoods Forestry Cooperative and the Brainerd Chapter of the Minnesota Forestry Association. This report is compiled annually by the Minnesota DNR – Forestry Division Utilization & Marketing staff. Special thanks to Mohammed Iddrisu, who did a fine job as lead author for the 2008 report. He will continue authorship in the future. The report is intended to answer frequently asked questions about Minnesota’s forest resources and forest industry. Hard copies will be available upon request to Mohammed Iddrisu after they’re printed in late April. Many thanks to those who cooperated in providing information and helpful input for this report, including many of Minnesota’s wood product companies, and the U.S. Forest Service Forest Inventory and Analysis (FIA) unit. Ainsworth’s Grand Rapids Oriented Strand Board (OSB) mill has announced a permanent closure in September of 2008. The mill has not been in operation since September 2006. The Cook and Bemidji mills have been shutdown permanently as well, announced in early January 2009. 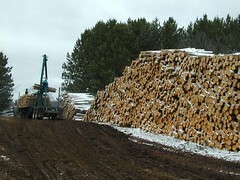 Weyerhaeuser’s Trust Joist mill in Deerwood has been in what has been termed an indefinite shutdown since September 2007. These and other slowdowns and curtailments continue to have a large impact on timber markets in Minnesota. Harvest levels of 2006 are down by over 500,000 cords from 2005 harvest levels. It is likely that a downward trend has continued through 2007 and 2008, resulting in opportunities and need for additional utilization and management of Minnesota’s forest resources. Timber imports of pulpwood into the state as well exports out of the state saw declines in 2006, and it is likely that this continued into 2007 and 2008. The change has been due to several factors, most notably reduced demand from mill closures and slowdowns. It is likely that Minnesota is still a net importer of raw wood as of December 2008, but by a greatly reduced margin. Overall net growth for all species continued to outpace harvest levels. According to 2007 FIA figures, annual net growth of growing stock on timberland was approximately 5.8 million cords and net mortality of approximately 3.10 million cords. According to mill and fuelwood survey data, the volume of wood harvested & utilized by industry and fuelwood users was approximately 3.2 million cords. Woody biomass use for energy markets and forest carbon credits are significant emerging issues that will have an impact on forest management in the future. An update pertaining to woody biomass use for energy and carbon credits are included in this report. If you have questions about Minnesota’s forest resources or this publication, you can direct them to the DNR Forest Products Utilization & Marketing staff listed below. Download the full report here (PDF, 1MB) or visit the DNR Utilization & Marketing site for past reports and related information. The high fixed costs associated with managing small parcels can be spread out across more parcels if you’re able to coordinate your forest stewardship activities with nearby woodland owners. Your forester, logger, or local MFA chapter may be able to help you identify other area landowners who might be interested in collaboration.